Akakū Maui Community Media will present LIVE coverage of the 2018 General Election on giant outdoor screens at Akaku Center where hundreds of people gather every election night to watch the results as they come in. Once again, the public is invited to come down throughout the evening, meet the candidates in person and join in the LIVE broadcast on Akaku Channels 53, 54 and 55. The coverage will feature several hotly contested Maui Council and state house races, a battle for mayor, a showdown for Governor, and more women on the ballot than ever before. 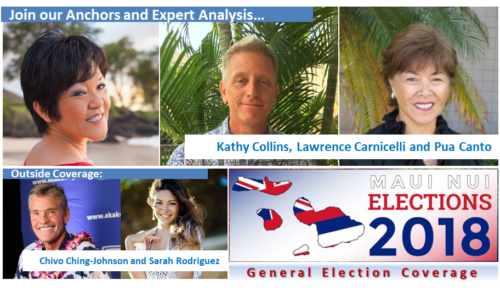 This may be the most exciting General Election season ever and it all comes to a head on Tuesday, November 6th at 6:00 PM in front of the Akaku Studios at 333 Dairy Road in Kahului. For those electing to stay home, up to the minute results from all the races will be broadcast on all three Akaku cable channels, on KAKU 88.5FM and streamed live to the web at www.akaku.org all night long until the winners are declared. For those of you on Social Media, you can find LIVE coverage on our facebook page. Anchor, Kathy Collins, will track the election results from the studio with expert analysis from Lawrence Carnicelli and Pua Canto. Akaku’s own Chivo Ching-Johnson will interview candidates, community leaders and Maui Nui’s most notable personalities at a special stage set up outside the station. Sarah Rodriguez will give updates on the party happenings outside and Shaggy Jenkins of KAKU 88.5 FM will be broadcasting from the radio kiosk. Food and refreshments will be available. For more information about Akakū’s election coverage, call (808) 871-5554. Akakū Maui Community Media empowers the community’s voice through access to media. Akakū is a 501(c)(3) non-profit corporation that airs content created by the community for the community.